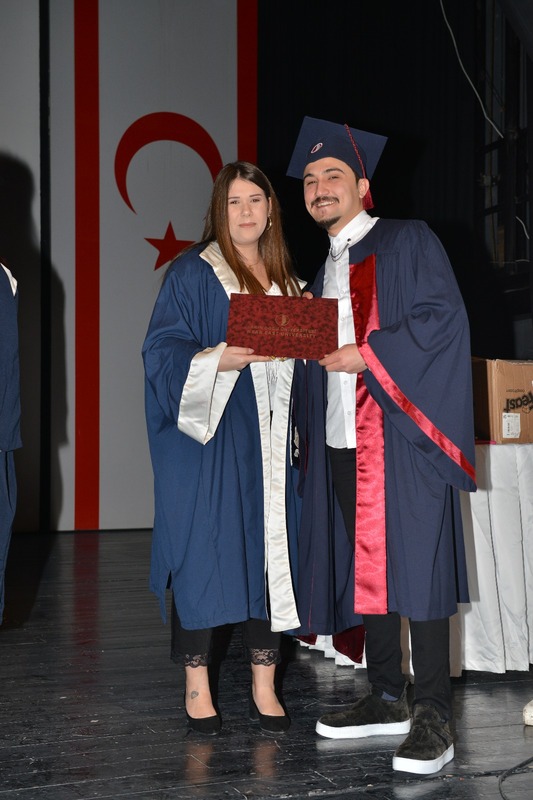 2018-2019 Academic Year Fall Term graduates of Near East University Faculty of Arts and Sciences received their diplomas with a glorious ceremony held at NEU Atatürk Culture and Congress Center (AKKM). 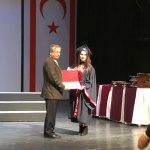 According to the press release issued by the Directorate of Press & Public Relations Office of NEU, the graduation ceremony was realized with the participation of the University of Kyrenia Rector Professor Ilkay Salihoğlu, NEU vice Rector Associate Professor Mustafa Kurt, NEU Faculty of Arts and Sciences Dean Professor Ali Efdal Ozkul, vice Dean Professor Evren Hınçal, department chairpersons, faculty members, students and their parents. 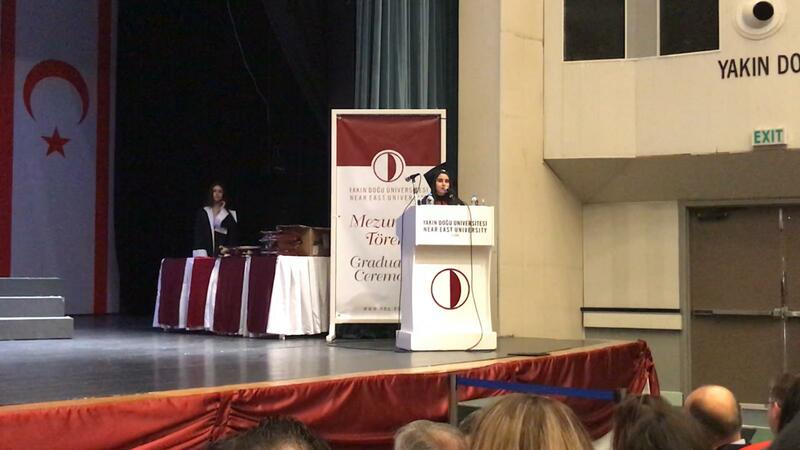 The graduation ceremony began with a commemorative stand in silence for Mustafa Kemal ATATÜRK and for all martyrs and followed by national anthem. 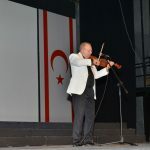 Then, the participants experienced joyful and unforgettable moments with the music recital performed by a faculty member from the Music Teaching Department of Atatürk Faculty of Education. 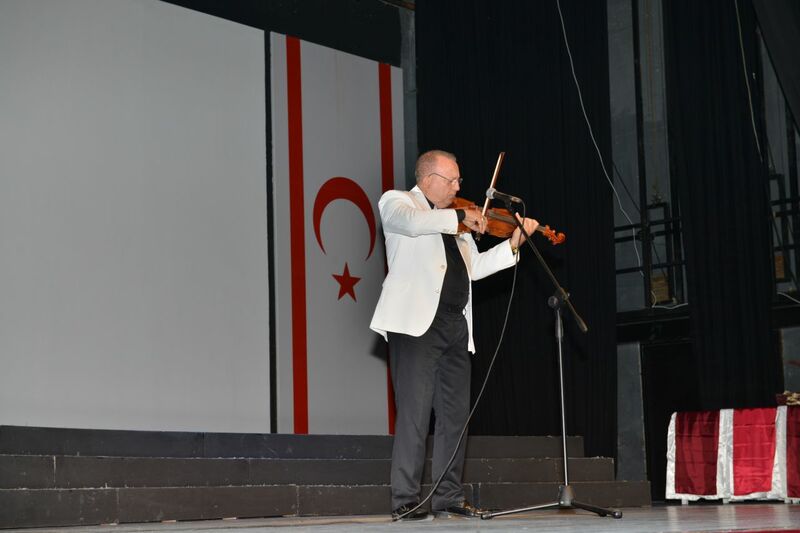 Following the recital, The Faculty Dean Professor Ali Efdal Ozkul, vice Rector Associate Professor Mustafa Kurt, University of Kyrenia Rector Professor Ilkay Salihoğlu, and on behalf of the graduates, Duygu Kılınç and Kaltrina Plakolli delivered a speech respectively. 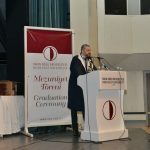 Delivering the opening speech of the graduation ceremony, the Faculty of Arts and Sciences Dean Professor Ali Efdal Ozkul underlined the crucial role of the efforts exerted by the students and academic staff in reaching this significant day and wished success and a brightened way for all graduating students in their future lives. Defining science as the overall intellectual and practical activities encompassing the systematic study of the structure and behavior of the physical and natural world through observation, research and experiment, Professor Ozkul underlined their commitment to continuing to provide quality education along with all possibilities required for conducting outstanding scientific studies. 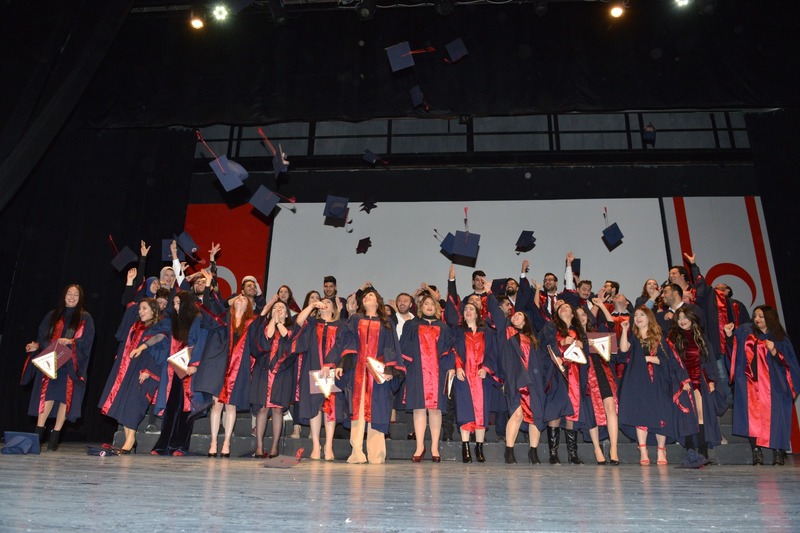 “Near East University Faculty of Arts and Sciences with its fully equipped departments, dynamic structure and competent academic staff is a vibrant intellectual body which offers quality education beyond the standards set by national and international bodies. Since our establishment, we devotedly continue to raise well-equipped graduates capable to address the needs of the sector. 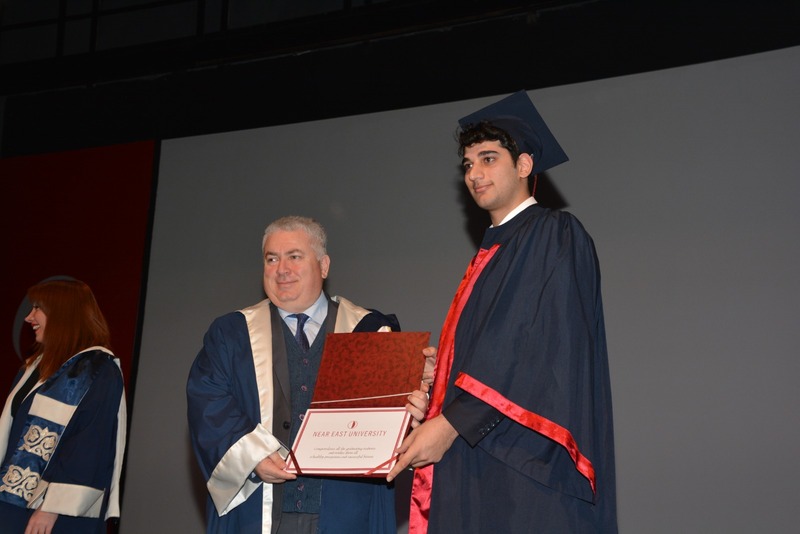 The best indicator of our success is the accomplishments of our graduates over the globe. Dear colleagues, all of you have a great deal of effort in paving the way for our faculty and university towards being a leading educational ground. No doubt that you are having one of the most enjoyable moments of your profession today. Your students are here in front of you as graduates. No doubt that you are proud of them. You have spared no efforts and done your best to educate your esteemed students in the best way. I would like to take this opportunity and extend my appreciations in recognition of your devoted efforts. 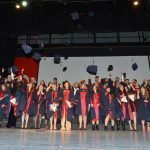 Dear graduates, you have successfully completed an important process in your life and you are starting a new road with a new energy, with high skills and knowledge that you have acquired throughout your education process. From now on you are competent and diploma-holder individuals. You will work all around the world and I am sure that you will represent our university, country and yourselves in the best way. 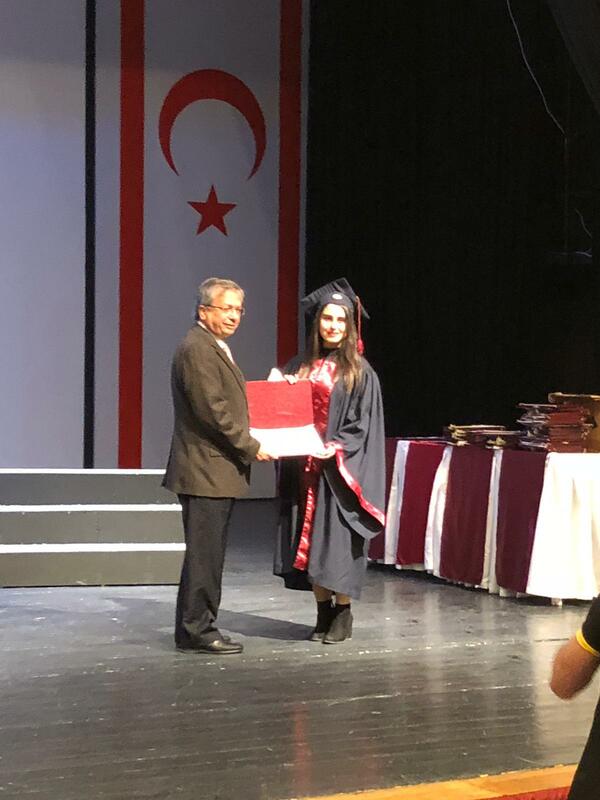 Our expectation is that you will leave your mark on many accomplishments wherever you go by being a representative of our university and the Turkish Republic of Northern Cyprus. All of you are the pride of us, our society and our country. I congratulate you and wish you success in your new route. Your continuous success in your career is the greatest wish of your parents and your teachers. I wish all of you good luck and continuous success on this long and challenging way. May God brighten your way” noted he. Professor Ozkul ended his remarks by addressing the parents: “Dear Parents, You are here today with high feelings. You feel the excitement of seeing of your beloved children graduating from a world brand university. Don’t have any doubt; Near East University has raised these young people well. Be sure of their future success and trust them, be proud of them” said he. In his opening remarks, Near East University vice Rector Associate Professor Doctor Mustafa Kurt delivered information regarding the achievements, scientific scholar publications and future goals of the Near East University by attaching a special focus on Near University’s place amongst the universities across the globe and Turkey. 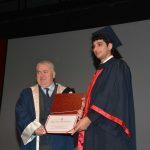 “Since its establishment, Near East University, which is the training ground of many successful professionals working across the world, has adopted it as her fundamental mission to continue to offer quality education and to raise creative and self-confident individuals, who are able to think critically and independently, who keep their responsibility over everything, who are highly equipped with research, teamwork and problem-solving skills and professional ethics, who have internalized the revolutions and principles of Atatürk and who pay regards to social , cultural and historical values” said he. NEU vice Rector Assoc. 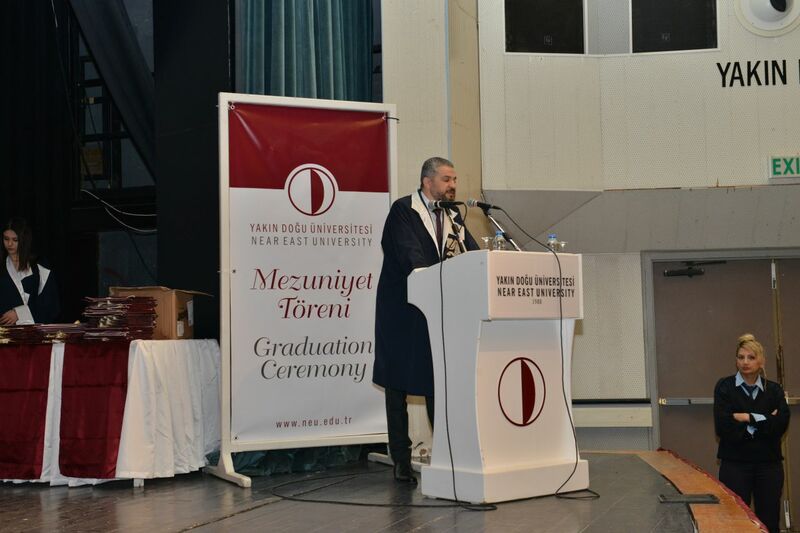 Prof. Dr. Mustafa Kurt ended his remarks by wishing continuing success and happiness to all graduating students. 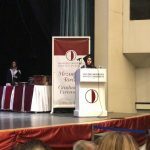 In his opening remarks, the University of Kyrenia Rector Professor Ilkay Kamiloğlu addressed the importance of the faculties of arts and sciences by underlining that a faculty of Arts and Sciences was a distinguished faculty and it constituted the building block of the universities. “Within a period of 27 years that can be considered relative to the history of a comprehensive and high level institute of science and education, Near East University Faculty of Arts and Sciences has developed with a dazzling pace by proving how productive faculty it is. Dear graduates, you should feel the right proud and privilege of being a graduate of a science-producing university. Always keep strict to scientific, professional and ethical rules taught to you. I wish that your new life brings success and happiness to you. May God keep your way open” said he. 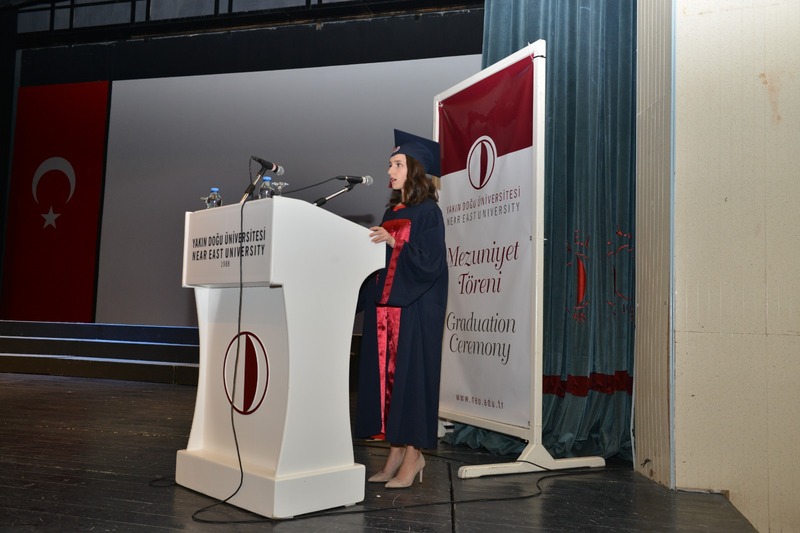 Delivering a speech on behalf of the domestic graduates, Duygu Kılınç, student graduating from the Department of Psychology of the Faculty of Arts and Sciences, addressed the academic staff, students and her parents. “Throughout my university education, I had the opportunity to experience the psychology education that I received and put it into practice by joining into the society and interacting with people. It was an arduous process; I studied hard and exerted great effort to get this diploma. Dear fellows, trust and respect yourselves, first of all, love yourselves and love your professions. When you achieve this, you will realize that the most outstanding success in your lives is much more than a numerical average or a status. And always keep in mind the Greatest Leader Atatürk’s saying ‘There is nothing that reason and logic can’t overcome’. I would like to take this opportunity and extend my thanks to all our teaching staff for their devoted efforts in raising us well. I also wish success for all my fellows in their future career” said she. 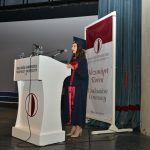 Following the speech delivered by Kaltrina Plakolli on behalf of the foreign students, the diplomas were presented to the graduates. Upon receiving the diplomas, the graduates experienced the joy of graduation by throwing their caps.